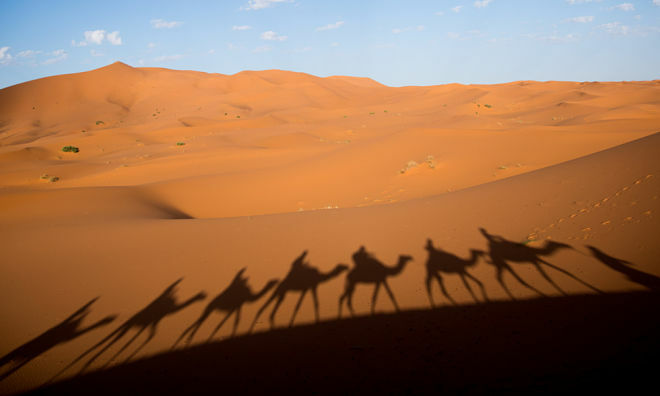 The Sahara Desert, one of the most severe and uninhabitable places on the planet, covers most of North Africa’s 9.3 million square kilometers of rock and dunes. But she was not always so deserted and dry. The primitive cave paintings and fossils found in the region suggest that the Sahara was once a relatively green oasis where human settlements, various plants and animals flourished. Researchers at the Massachusetts Institute of Technology (USA) analyzed the deposition of dust along the coast of West Africa over the past 240,000 years and found that the Sahara in particular and North Africa in general, change the climate from dry to wet every 20,000 years. Scientists say that this climatic pendulum is controlled by changes in the inclination of the earth’s axis. Due to the difference in the distribution of sunlight between the seasons every 20,000 years, the Earth experiences a change in the amount of sunlight received from larger to smaller and then back again. In North Africa, increased solar radiation intensifies the region’s monsoon activity, making the Sahara more moist and greener. When the volume of incoming summer sunlight decreases, the monsoon activity weakens, resulting in a dry climate, similar to what we see today. Scientists analyzed the sedimentary core extracted from the ocean floor along the coast of West Africa in order to learn the clue to the secrets of the Sahara’s climate history. These cores contained layers of ancient rocks that had been deposited over millions of years. Each layer contained traces of Sahara dust, as well as remnants of life forms, such as tiny shells and plankton. Researchers under the guidance of lead author Charlotte Skonechny from the University of Paris-South (France) studied sediment layers over the past 240,000 years. They analyzed each layer for traces of dust and measured the concentration of a rare thorium isotope to determine how quickly dust accumulates on the seabed. Thorium is produced in the ocean from very small volumes of radioactive uranium, dissolves in seawater and is quickly attached to sinking sediments. Scientists can use the concentration of thorium in sediments to determine how quickly dust and other sediment accumulated on the seabed in the past. At times of slow accumulation, thorium is more concentrated; at times of rapid accumulation, the concentration of thorium is low.